Are you generating the best possible results from your email marketing campaigns? According to a recent study by VentureBeat, email has the highest ROI of any marketing channel available. But if you aren’t optimizing your email campaigns for conversion, then you could be missing out on valuable clicks, sales, and ultimately, revenue for your business. 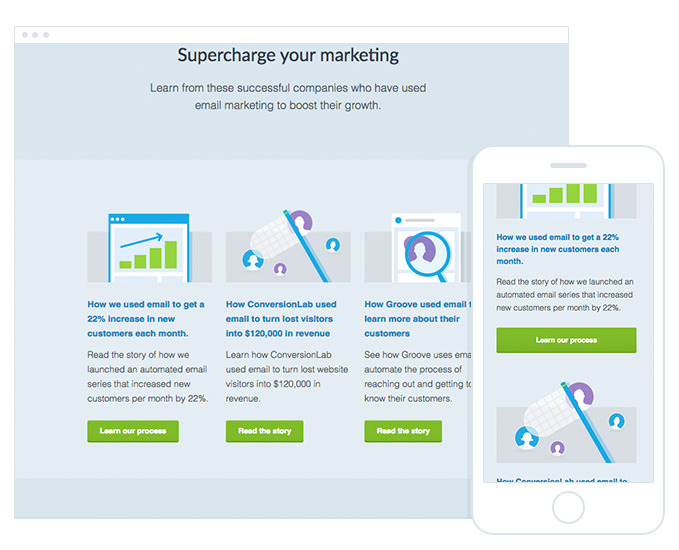 By reading this guide, you’ll learn the four principles of high-performing email campaigns. Plus, receive a handful of tools and resources you can use to easily create high-converting email campaigns that deliver business results. There are many different types of email campaigns that you can send with the goal of driving conversions: announcement campaigns for the launch of your latest product, newsletters summarizing your latest content, or invitation emails to an upcoming event, and more. Regardless of the type of campaign, the key action you want your subscribers to take is to click-through from your email to the destination you’ve chosen to drive them to. The following four principles will help you create a high-performing campaign that increases the number of readers that click-through from your email to your chosen destination. Research shows that an adult’s attention span is, on average, eight seconds. With such a short attention span, you can assume people aren’t actually reading your campaigns word for word, instead scanning through them looking for something of interest. Therefore, writing long, text-heavy email campaigns isn’t the best approach. Structure your emails to help draw people into reading your content while guiding them toward the email’s CTA. As you can see from the example above, emails following the model contain a succinct headline that highlights the key message of the campaign as well as supporting information and visuals to help convince readers on the benefits of clicking-through. The reader is then presented with a prominent call to action button that makes it crystal clear what to do next. The inverted pyramid model works particularly well for campaigns with a single message and a single call to action, such as announcements and marketing offer campaigns. But what about email campaigns that contain multiple messages and calls to action, such as a newsletter? Despite containing multiple pieces of content (like many newsletters do) the information is broken down into easily consumable sections. The inverted pyramid model is used within each section to draw scanning readers in and drive them to the call to action button. 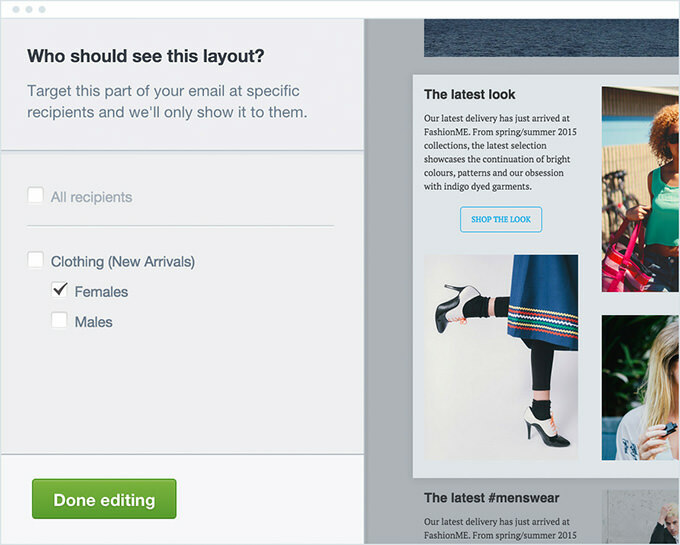 For Campaign Monitor customers, creating well-structured email campaigns like this is easy using the drag-and-drop email builder and many of our pre-designed templates are structured with this exact model in mind. Once you’ve created a campaign in Campaign Monitor, you’ll land in our template library where you can select one of the 25 pre-designed email templates. From there, drag-and-drop images, text, buttons, and spacers anywhere in your email to create a high-converting layout that fits your content goals perfectly. You can even preview the email to see exactly how the structure will look across all inboxes and in mobile devices. While this might seem like an astounding statistic, it makes sense that someone is much more likely to open an email that appears relevant to them. Your subscribers could be male or female, located in different countries, have different interests, or be in a completely different buying stage of your product. Given these differences, sending them the exact same campaign is only going to result in the content being irrelevant to a certain number of subscribers. So instead of sending one campaign to everyone, you should segment your lists and only send relevant offers and content to a each unique segment. 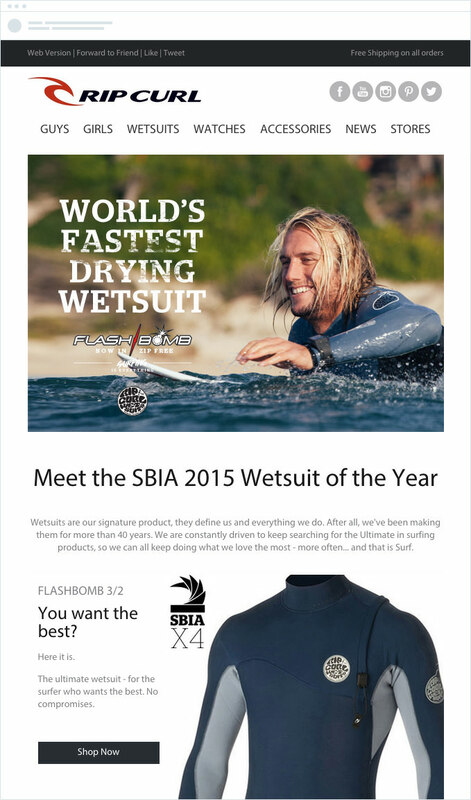 Although RipCurl sells women’s wetsuits and bikinis as well, they know who their male subscribers are and thus only include information about the latest men’s products in the newsletter to their male subscribers. If you’re a Campaign Monitor customer, it’s easy to make your campaigns relevant to every subscriber using Segments & Dynamic Content. Clothing retailers, for example, can use segmentation to organize their list by unique data points they have about their customers, including insights like gender, location, previous spend amount, and purchase history. Once the list is segmented, dynamic content can be used to change the content of the emails so that certain sections (i.e. menswear) only show to certain subscribers. This ensures the content of the email is relevant to each individual subscriber and increases the chance they’ll click-through from the campaign. It’s likely that your email campaigns aren’t the only interaction your subscribers are having with your business. In fact, your subscriber probably visited your website or social media page just to sign up for your email. Because of this, it’s important that your email campaigns are aligned with the colors, fonts and branding you use across all your other customer touchpoints. This helps ensure your subscribers know the campaign is coming from you, and helps create a level of trust and credibility in your campaign that reassures people it’s safe to click through. Nobody wants to open or interact with an email that feels foreign. 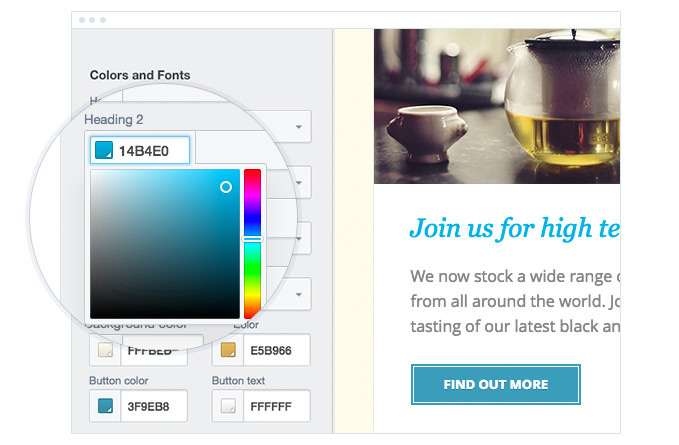 As you can see, the fonts, colors, buttons and even the iconographic style they use on their website are perfectly replicated in their email campaigns. 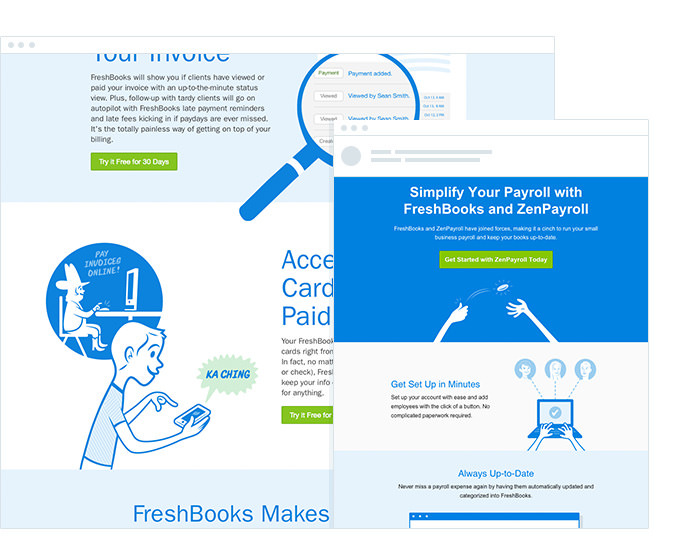 This gives their customers and subscribers a consistent, branded experience that is unique to Freshbooks, and creates a level of trust and credibility in the campaign that reassures people it’s safe to click through. If you’re a Campaign Monitor customer, this can be achieved with ease using the drag-and-drop email builder. With the ability to choose from a range of designer-selected, professional fonts and the option to select your brand’s exact hex color, it’s effortless to create a high-converting email campaign that instills trust by being consistent with the other places your subscribers are interacting with your brand. In order to drive your subscribers to click through from your email campaigns, you must make it as simple as possible for them to do so. According to our research, 63% of opens are happening on mobile devices. So if your campaigns aren’t optimized across all devices then there’s a good chance you’re making it unnecessarily difficult for your subscribers to convert. 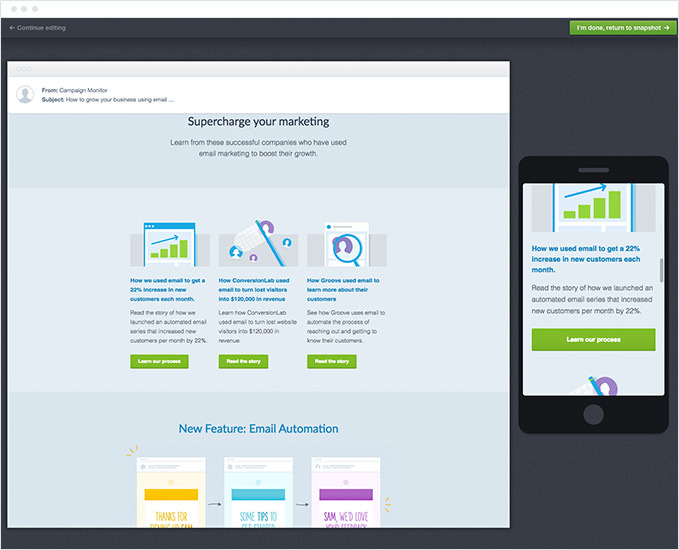 For Campaign Monitor customers, ensuring your email campaigns are responsive is taken care of for you and any emails you create in the drag-and-drop email builder are automatically responsive and guaranteed to look great on all devices and in every inbox. The builder also has a simple preview mode that allows you to see exactly what your campaigns are going to look like on both desktop and mobile devices. 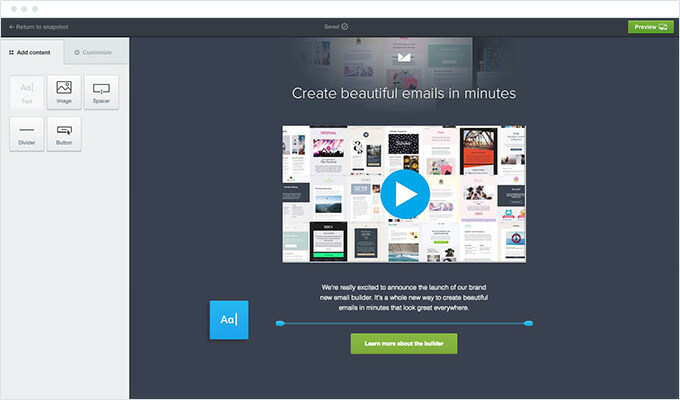 When it comes to creating high-converting email marketing campaigns, tools like Campaign Monitor’s drag-and-drop email builder make it super easy to insert text and images, target them at specific segments of subscribers and ensure they look great on every device. But what about creating those images in the first place? Most marketers don’t have a developer background nor Photoshop skills, so we wanted to share a few resources that can help you create high-quality images and graphics that you can add to your email marketing campaigns to help them look amazing and convert better. Stock photography sites are a great way to curate images for your email marketing campaigns. Unfortunately, most stock photo sites are full of cheesy, corporate photographs that you wouldn’t really want to include in your campaigns. Death to the Stock Photo – Death to the Stock Photo is a free subscription service that sends subscribers 10-12 high-quality photos each month via email. Gratisography – This great site offers free, downloadable images that professional photographer Ryan Bell captured over time. Unsplash – Hosted on a simple Tumblr account, the images Unsplash offers are breathtakingly beautiful. Submitted by different photographers from around the world, the photos on Unsplash vary in subject matter from landscapes to technology and are perfect for use in your email campaigns. IMCreator – The free images you’ll find on this site are not original, but rather a curated collection that are approved for commercial use. If stock photography doesn’t quite work for the specific campaign you are trying to send, there are image creation tools that will help you create the perfect image for your campaign. Canva – The tool contains thousands of beautiful stock images which you can easily add other elements to, such as text, banners, frames, and buttons. PlaceIt – PlaceIt makes it easy to create beautiful screenshots of your website, application or any other digital product. You simply type in a URL, and PlaceIt automatically generates a screenshot and places it inside a device in a particular context, such as an iPad sitting on a desk or a MacBook Pro sitting on a park bench. The Noun Project – Think of The Noun Project as ‘Google for Icons’. You simply search for the type of icon you need and the site will return hundreds of options to choose from. Dry Icons – Dry icons is a icon marketplace containing over 5000 icons across more than 70 icon sets. Many are free to download, while some will cost you a few bucks. Elegant Icons – Elegant icons is a free icon set (with 384 different icons) by web design house Elegant Themes. 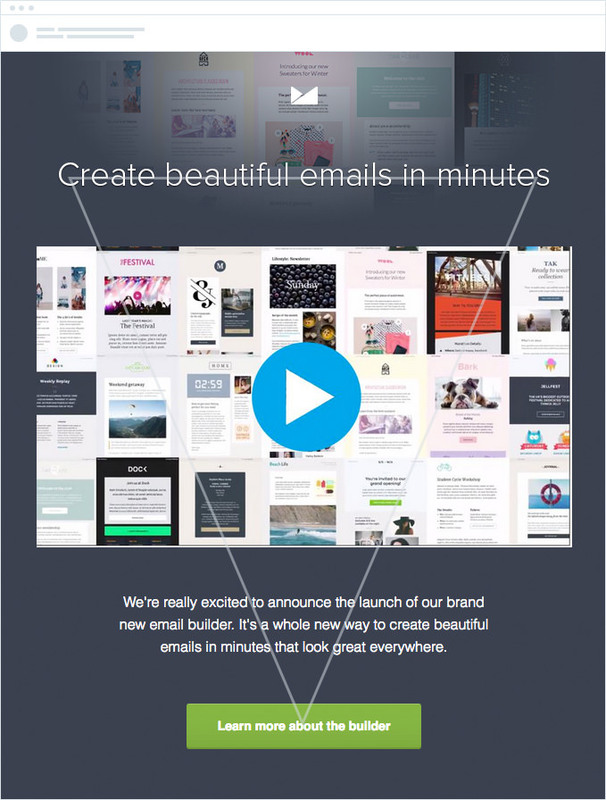 Whether you use an image or an icon, Campaign Monitor customers can easily drag and drop their chosen files into their emails to give their campaigns a unique look and feel that draws readers in and increases conversions. Email marketing is one of the most effective channels available to marketers today, but if you’re not optimizing your email campaigns for conversion you could be missing out on valuable clicks, sales and revenue for your business. So next time you are creating an email marketing campaign, whether it be a newsletter, marketing offer or announcement, apply the four fundamentals of high-converting campaigns to get better results for your business.